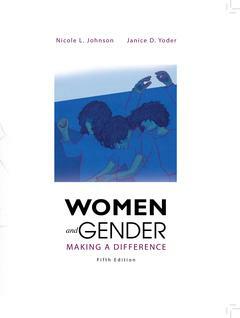 In this fifth edition, Nicole Johnson and Jan Yoder's Women and Gender takes clear aim at its goals for social justice by striving to make a difference in the personal lives and relationships of readers, to make a difference to the scholarship of psychology, and to make a difference through the activism that connects the personal with the political. As with the previous editions, Women and Gender remains sensitive to intersectionality and the social construction of gender. It takes a holistic, dynamic approach that blends understandings of biology, socialization, aging, individual differences, and social contexts, including stereotyping and social status. Building on these understandings, it explores women's relationships, employment, body image, physical and mental health, male violence against girls and women, and women's power and empowerment.